Simply Natural Nails opened at 50 Loomis Street on November 16th. I recently spoke with it's owner Kimberly Fosmire. Kimberly has been in the beauty business for 16 years. 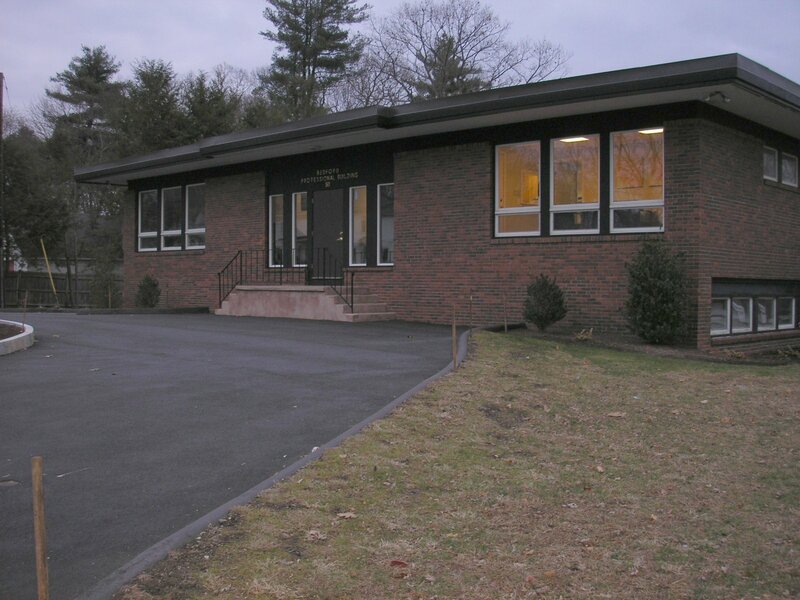 She previously owned 2 Salons in Billerica and has sold Beauty and Nail products for the past 5 years. Last year she worked part time at several Spa's. Kimberly, who lives in Bedford, recently decided she wanted to open up a "Green" Nail Salon that only used natural and organic products while avoiding potentially toxic chemicals like toluene and formaldehyde. Kimberly believes that Nail Salons should make the switch to more natural products and she wanted to help lead the way. In fact, San Francisco last month passed the nations first Healthy Nail Salon Recognition ordinance which offers a voluntary recognition program for salon owners who use nail polish that does not contain dibutyl phthalate (DBP), formaldehyde or toluene. She also wanted the Nail Salon to be more like a tradition private Spa environment. Based on this, she decided to avoid the typical Nail Salon strip mall location and opened in a former Doctor's Office near Depot Park. The new store has the look and feel of a Spa and features private rooms for Manicures and Pedicures. Afterwards they encourage clients to relax for a few minutes in their private post nail lounge while they wait for their nails to dry. For clients who don't want to wait for their nails to dry, the Salon offers Shellac, which is cured by UV light. 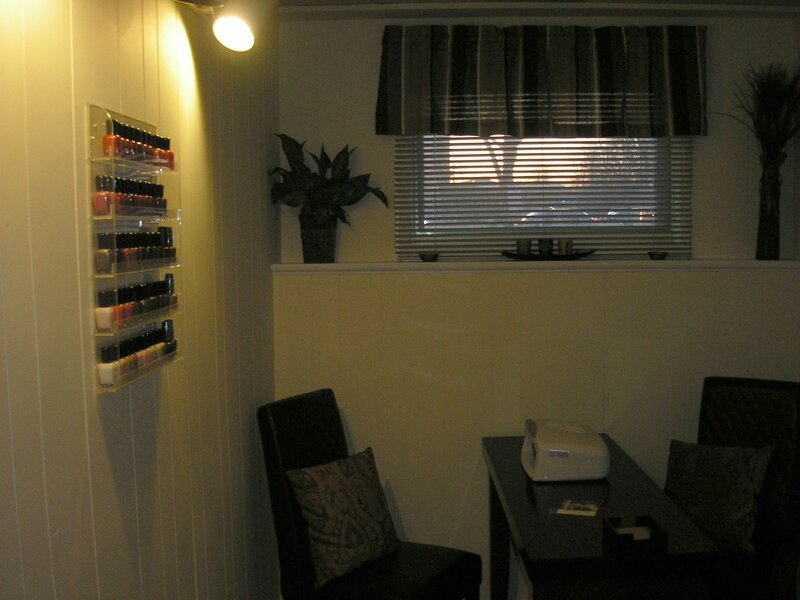 The Salon also features a private room with a Television for clients to relax while their nails dry. Tea or Coffee are also provided. Along with the focus on Natural and Organic products, the salon also choose to focus on improving nail health with improved sanitary procedures. According to Kimberly, virtually all of their nail implements are disposable (clients are given the option to take them home). The remaining items are disinfected using hospital grade procedures. system that completely drains after each use. The Salon which does not have a receptionist, encourages it's clients to book appointments online. In fact, Kimberly mentioned that she does not answer the phone when doing nails. 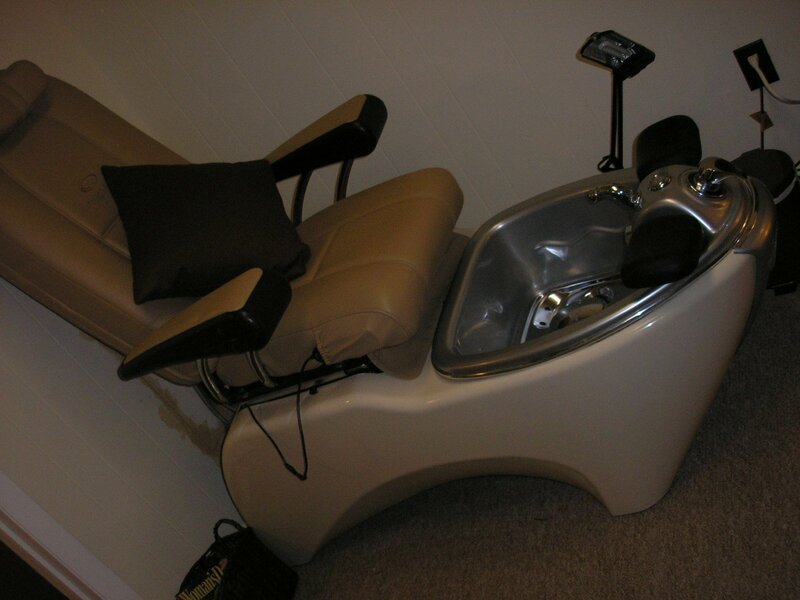 Along with the nail services, the Salon offers beauty products for sale. Kimberly mentioned that she has been able to promote her business through her other businesses and through social media such as Facebook. The Salon is currently open Tuesday through Saturday. Kimberly may add a message therapist in the near future. 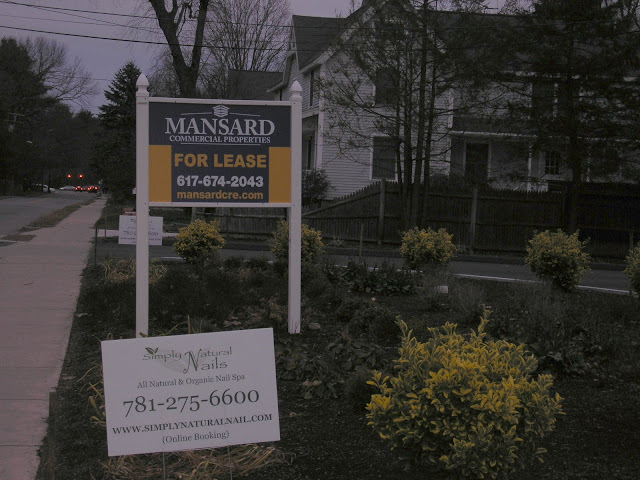 A permanent sign is expected soon. 1. It's interesting to note, that this marks the 3rd new Salon in Bedford in the past 6 months (both Salon Oz and TL Nails Spa opened this past summer). 2. In the past few months, I have begun to see retail businesses in Bedford taking advantage of social media tools such as Facebook and Twitter to promote their businesses. This is an encouraging sign. 3. Since the renovation of Depot Park, we have begun to see more retail businesses open nearby. I expect this trend to continue. Alongside the nail benefits, the Salon offers excellence items available to be purchased. I think that idea that you have mentioned here is not bad and we all should try it at least once. I really appreciate your thinking and say you thanks for this. Thanks for the information, i really like the article. I had never read such kind of information in my life and i am very much impressed with the way you have write this post here. Thanks for sharing this post with us. Keep sharing such good posts. I appreciate the content on your internet site. thnx! Great ideas and design. I'll try to use something from it for my home. Promotion of the salon in social networks is very important for attracting new customers. In the world of Internet technologies, this should be given very great importance. All people are constantly in their gadgets and communicate through them. I like the details that you have shared to your readers like me since I love reading health blogs I like your blog and also like the images you choose. Advertisement of your work is very much important for the business to grow. Today in this world of technology internet has become the main source of advertisement. Any kind of business can be promoted if you have that skill of marketing. Nowadays the most number of customers have some problems with the credit history, which requires improvement. Opportunity to cope with all your financial problems within one business day makes this type of borrowing money the most popular one. For that reason, you have to repay the loan within a particular time period. If you are not able to repay the particular amount from your loan within the allotted time then the lender may possibly file a legal suit against you. For instance, what will happen if you need to pay for an electrician during an emergency?